He likes to cross cultural and geographic borders. 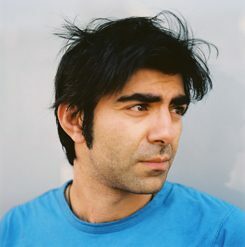 With his stories, which are set in Germany and Turkey, the auteur Fatih Akin has gained international recognition. Fatih Akin | © Achim Kröpsch Many characters in Fatih Akin’s films share a capricious fate. There is the petty German-Serbian criminal who dies in an attempt to become a member of the Mafia, the Turkish alcoholic with a propensity to self-destruction and the chaotic German-Greek who fights to save his restaurant with the courage of desperation. Akin often finds the ideas for his characters in his own biography. He was born in 1973, the son of Turkish immigrants in Hamburg, and grew up in a district that was regarded as a typical “problem neighbourhood”. As a teenager, Akin was himself a member of a street gang. In an interview with the Zeit, he once said that his mother had saved him from the fate of many of his teenage friends: “Deported, prison, overdose”. It was a story straight out of this milieu that made Akin known in Germany as a director and screenwriter: his feature film debut Kurz und schmerzlos (i.e., Short and Painless) (1998) is about three criminal friends from Hamburg. The film received attention above all because it told a story about a problem neighbourhood without resorting to affected social criticism and wagging an admonishing moralistic finger. The lives of immigrants in Germany have ever since been repeatedly a theme of Akin’s films. His first documentary film Wir haben vergessen zurückzukehren (i.e., We Forgot to Go Back) (2001) tells the story of his parents, who went to Hamburg as guest works in the 1960s and then stayed in Germany. His feature film Solino (2002) shows a similar life-story from the point of view of an Italian family in Duisburg, though this time, by way of exception, the script was not written by Akin. Because his films took up themes concerning immigration, the German media sometimes saw Akin as a representative of the so-called immigrant cinema of the 1970s and 80s that placed particular emphasis on cultural differences. Immigration was shown here primarily as a sense of alienation, as a problematic “Us-Them” feeling. With his first international success, Gegen die Wand (Head-On) (2004), Akin began to emancipate himself from this image. In this film he tells the story of young Sibel from Hamburg, who marries the alcoholic Cahit so as to escape the home of her conservative parents. Their immigrant background is part of the identity of both the main characters, but it is not determinant. They are no longer merely Turks, but German Turks. It is normal for Sibel and Cahit to jump between the two cultures. They dance to traditional Turkish folk music and to Western pop, change languages in mid-sentence. They are exemplary of a whole generation for which there is no longer an “either / or” and which is today a natural part of German society. Since this generation is often under-represented in German cinema, it has been one Akin’s merits to have put them on the screen. At the film festival in Berlin, Gegen die Wand won the Golden Bear. The prize thus went for the first time in eighteen years again to a German production. In 2004 there followed the German Film Prize and the European Film Prize as Best Film. Gegen die Wand is the first part of a trilogy whose title is Liebe, Tod und Teufel (i.e., Love, Death and the Devil). The second part, devoted to death, is the film Auf der anderen Seite (i.e., The Edge of Heaven) (2007). It is the story of six people in Bremen, Hamburg and Istanbul, who are connected to one another through family, as lovers or through death. Two of the main characters are killed in accidents and the survivors begin to search for and forgive one another. Akin develops here the theme of the simultaneity of two cultures, which he already treated in Gegen die Wand. Turkey is no longer seen at a distance, as the country of origin of the parents’ generation, but rather as a scene of action equally as important as Germany. Apropos this, Akin has said in an interview with the film magazine epd Film: “My sense of home has expanded. As tectonic plates come closer together, so too have Turkey and German grown together for me”. With the expansion of the scene, the degree of Akin’s international recognition has also grown. In addition to the Screenplay Prize of the Cannes Film Festival, Auf der anderen Seite has also received awards in Turkey, Croatia, the Philippines and the United States. In German-language film criticism, Akin is no longer a Hamburg immigrant film-maker, but a representative of a world cinema marked by his cosmopolitan attitude. Home always also means for Akin Hamburg. When he writes a script with scenes in Germany, then they take place in the hanseatic city. He is most interested in the Hamburg in which he grew up: where trendy pub and the Turkish cultural association are not far apart. He dedicated the film Soul Kitchen (2009) to his home town: a German Greek wants to save his fast-food restaurant in Hamburg-Wilhelmsburg, also a “problem neighbourhood”, from demolition by a greedy investor. This results in an affectionate, anarchic story full of funny incidents. Soul Kitchen is first and foremost a comedy, but also critically broaches the issue of the displacement of subcultures and socially vulnerable residents in Hamburg. Akin chose locations that are about to be demolished or gentrified for shooting. The auteur became explicitly political in his documentary Müll im Garten Eden (i.e., Rubbish in the Garden of Eden) (2012). Again, the story is about a threatened home: the idyllic village of Çamburnu, which lies in a tea-growing area in northern Turkey, is destroyed by a newly planned landfill. Akin documents the protest of the residents, who must finally watch as the toxic sludge of the landfill buries the green hills under itself. For Akin these events are part of his personal history: Çamburnu is the village of his grandparents. The last part of the Liebe, Tod und Teufel trilology is called The Cut and is expected to be completed in 2014. In this film Akin crosses several borders: it was shot in Jordan, Germany, Cuba and Canada. Patrick Schütz works in the Internet department of the Goethe-Institut and writes for the music magazine “Groove”.